Bus. 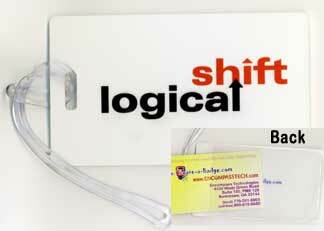 Card Luggage Tag Our fiberglass reinforced plastic luggage tags are custom printed on one side with your full color logo, photo/image or ours. The other side has a clear side mount business card size pocket. The tag comes with a plastic luggage loop. Tag size is 4.25" x 2.5". The introductory price for this item is the same as our magnetic back name badges (see our home page for prices). If you want to use one of our designs on your luggage tag, just note the design name in the comments area of your order.